Constituent natural beauty of Kerala finds its best piece in the backwater destination of kumarakom. As already said kumarakom is situated on the banks of Vembanad Lake. The place is a paradise on earth with its mangrove fields, coconut groves and endless other wonders. As one of God's creations to inspire envy, destiantion kumarakom is a marvellous tourist place to visit and stay at if you are looking for a peaceful vacation away from the hustle and bustle of metro life. Indian Tour Planners offers the best place to find houseboat cruise and luxury houseboat to sail through the beautiful backwaters of Kumarakom. A travel through the backwaters of Kumarakom is an experience which is memorable for a lifetime. The voyage in the houseboat cruise is an enchating experience as you would be accompanied by the natural beauty with singing birds, the dancing paddy fields and the pure mist. The houseboats offered by us has got all the secuity features prescribed by the governments and are made to suit the luxurious needs of the tourists. The kerala style houseboats offers the tourists an opportunity to understand the tradition of God's own country, Kerala. The houseboats in kerala other wise called as kettuvallams or country boats that were used in the early days for the transport of goods from the isolated interior villages of Kerala Backwater area to the towns like Alleppey, Kollam, Cochin and Kottayam. With the advent of roads, bridges and ferry services, gradually the kettuvalloms were not been used. Now a days these so called riceboats are back again with a touch of tourism as a major attraction for travellers in the modern time. the size of houseboats in kerala ranges from 95 feet in length and a width of around 13 feet to in the middle for one bedroom houseboat and , big houseboats with up 107 feet long and up to 19 feet wide. These houseboats are made used natural woods and made in an ecofrinedly manner. The houseboats in kerala has got fully furnished with one to five bedrooms and has got sundeck and other modern amenities. Almost all the riceboats in Kerala have a three member crew - a chef, driver & cabin assistants. The cook will be your host in the houseboat and act as a guide to show you the wonders of kerala backwaters as you are on the go. The food served in the houseboats has traditional Kerala flavor with the local specialties; delicious local fish etc. Marvellous beauty of the backwaters of kerala needs no introduction. A Kerala Houseboats cruise along the palm-fringed waterways of Kerala in luxury houseboats is the most enchanting holiday experience in India. A guided tour down the backwaters would provide you with a complete and most enchanting experience on the back waters of Kerala and will also reveal to you some interesting facts about the life of local village people. come and enjoy the scenic backwater life with the best houseboats in kerala. Tourists around the world visit this India and plan trips to the tide of Kerala. There are several fascinating destinations in the state of the tide. Alleppey, Kovalam, Kumarakom, the Vembanad Lake, Kottayam, Kuttanad, Trivandrum, Thiruvallam, Kasargod, etc. are a few names. All these destinations are scenic and beautiful enthrallingly. Nature blessed the destinies of the state of the tide exceptionally. The lusts green surroundings and delightful ambiance provide memorable sightseeing options and holiday. These destinations are dotted with several attractions like temples, traditional villages, forts, palaces, churches, Chinese fishing nets, lovely lakes, Ayurvedic massage & treatment of the centers, the resources of Ayurvedic & Spa, the luxurious accommodation of the boat house, the boat rice, wild animals, aquatic life, etc.. exciting trips exploring the beautiful state provides a delightful experience by the time of life. Definitely the course of the voyage of the state worth it exploit. One way the most popular and the most appropriate experience the real charm of fascinating destinations in the state of the tide is employing a luxurious houseboat. If you too want to enjoy the charm of scenic trips in the state you must hire a houseboat (traditionally called Kettuvalloms) and spend few days onboard. The tide of houseboats in Kerala are the main attraction and tourism course in the state. The houseboats, known as traditional Kettuvalloms are equipped with modern courtesies. Are components of the eco friendly materials. Internal rooms have the bed, kitchen and dinning area. Total, houseboat provides excellent and wonderful accommodation to luxury and traditional hospitality. Surly, the houseboats in Kerala will seduce you. The waterways, channels, ponds, the lakes, rivers, entries, etc.. team up together and shape the exciting trip to Kerala - one of the most beautiful states of India and attract. There are several attractions of tourist interest in the state but the tides have their own charm. The tides of the state enthrallingly are beautiful and deserve the attention of tourists shape the world. Explore tides of the state provides delightful thrills to adventurous tourists. To the delights of nature lovers. Provides serene and delightful ambiance for pairs of the honeymoon. Fills a special charm and romance of a holiday for honeymoon. Deserves the attention of the holiday weekend. Indeed, the tide of the state's destinations are very popular among every type of tourists. Kerala, the paradise for travelers is a land famous for its tides tranquil, ancient temples, verdant valleys and vast plantations of cloves of cardamom and coffee. It is a land of coconut embellished with woods and exotic beaches, to press between the Arabian Sea and the dense forests of Western Ghats. This calm state of south India is also consulted as the country of God because each state has some of the temples exquisitely chiselled as highly revered among the Keralites. Even Kerala is blessed with myriad of culture that are very well maintained by both the state government and people of the state. Kerala is one of the hot spots of the Honeymooners in India is positioned in the southwest tip of Indian mainland on the Arabian Sea. is limited by the Arabian Sea in the west by Karnataka in the north and northeast and east by Tamil Nadu. The climate is tropical calm of this state. Weather in Kerala is not the cold that is the main reason behind its emergence as a hot tourist destination. Kerala has a unique charisma of its own which is totally different from other Indian States. There is an endless list of hilarious things that can capture your fascination for its beauty. Kerala has a wide range of tourist attractions such as tides, ancient temples, shrines of wild animals, the hill stations, beaches and more things of fascination. This serene state has over 900 km of waterways, rivers and lakes and interconnected entries that are major components of the tides of Kerala. If you do not get the opportunity to visit the city of Venice and walk of Gondolla, than you should come to Kerala have the same experience. Most cities in Kerala SERE as the points start and end of the cruise trips and hosts many famous boat races. These cities are a mixture of historical and modern world. The Globetrotters in each hole and corner of the world come here to enjoy the scenic beauty of the trip destinations. That are also famous as a hot spot of the moon of honey ideal. Some of the cities famous tides are Cochin in Kerala, Alappuzha, Kasargod, Koller, Kottayam, Kozhikode, Kumarakom, Kuttanad, Thiruvallam, and Thiruvananthapuram. the state is in accordance with the natural and climatic conditions of the state. Every city of Kerala has at least one or more churches that follow its origins to antiquity. Some of the revered temples of Kerala are the temple of the Padmanabha Swami, temple in Thiruvananthapuram, Trichuris in temple, temple of Sabarimala of Sivagiri of Guruvayoor in Pathanamthitta, Tiruvalla in the temple in the temple Mannarshala in the temple in Alappuzha and Ambalapuzha in more temples. Other sought after more hidden treasures of Kerala are its hill stations of salutarmente. These stations enchanting Nestled in the lap of the mountain of Western Ghats and the blue mountains. The hill stations of the state are the ideal destinations for an encounter with oneself. These features of the mountain are so cool and calm, it will fascinate you by its simplicity certainly. The hill stations of Kerala are home to the vast tea, coffee, the cardamom, the pepper, the vanilla and rubber plantations. Munn, Wayanad, Idukki, Ponmudi, Devikulam, Nelliampathy, Wagamon etc.. are some of the hill stations of Kerala known. These stations of the scenic mountain is the best place for nature photography, trekking, mountain climbing, Birding, the spice tours, cruises etc. the boat on the lake. Positioned between the dossier lusts of Western Ghats, Kerala has 12 wildlife sanctuaries and 2 of national parks. These sanctuaries for wildlife and national parks have a rich collection of diverse flora and fauna. These homes of rare wild animals have the ability to beckon the nature lover or wildlife of the place far and wide. A tour of the elephant is appropriate to explore the verdurous of wildlife sanctuaries and national parks in the state. This tour of wild animals makes it possible to get closer to many more wonderful creations of mother nature. Some of luscious sanctuaries and national parks of sanctuary of wild animals are wild animals Pepper, sanctuary of wild animals Neyyar, sanctuary of wild animals Shenduruni, the wildlife sanctuary of Periyar, the wildlife sanctuary of Idduki, sanctuary for animals Chinn of wild, the bird sanctuary of Kadalundi, the bird sanctuary of Thattekad, the bird sanctuary of Kumarakom, Silent Valley National Park, Eravikulam National park and more. These resources of wild animals are apt to that jungle trekking. Among several charming aspects of Kerala, the beaches are one of the main attractions of the state. Kerala has a coastline of 600km long embellished with some exotic beaches and the finest world class, lakes, ports and natural angras protected. These beaches are the favorite features of national and international tourists. The beach of Kovalam, the beach of peoples, the beach of Varkala, a beach in Alappuzha, Cherai beach of the the beach of the fort Kochi, the beach etc.. Kappad are some of the popular beaches blessed with beauty exciting. These beaches are the best place to enjoy a holiday of leisure. But if you are an adventure enthusiast, than you may be given in various water sports such as swimming, diving autonomous, surfing and more. Last but not least, the Ayurvedic treatment is another important attraction of Kerala. Ayurveda is an ancient form of treatment, believed to be originated in Kerala. Many holidaymakers come to Kerala with a desire to cure his illness Aid (automatic device of entrance) of ayurveda, which is assumed to be the best way of treatment without submitting to any surgical operations or intaking heavy doses of expensive drugs. Thus, whenever you visit Kerala, not forget to check out the various Ayurvedic centers in the state. Some of the famous center of the Kerala Ayurveda is healthy Rajah acres in the district of Palakkad, Manas Send Sarov Ayurveda in Trivandrum, the beach house of Karakathi in Kovalam etc. By Air: To help national and international tourists, Kerala has three ports for improved air such as Thiruvananthapuram, Kochi and Kozhikode. These same airports international flights also doubles regularly. The international destination which is joined to Kerala and Colombo, Maldives, from Abu Dhabi, Dubai, Sharjah, Bahrain, Doha, Ras Al Khaimah, Kuwait, Riyadh, Muscat, Fujairah and Singapore. By Rail: Every place in Kerala is very well connected among them by the extensive network of Indian railway. Even with the other parts of India. There are nearly 200 train stations in Kerala today. The cast intercity trains connecting Delhi with the four metropolitan cities of the country such as Mumbai, Delhi, Chennai and Kolkata. By Road: An extensive network of roads connects each smooth region of Kerala with each other. The national road 47, 17 and 49 attached to Kerala with rest of the country. The word Yoga was originated from Sanskrit which means the union of mind, body and spirit. The yoga can also be defined as the practice of physical postures or poses. The scope includes the techniques of yoga breathing, the meditation, the awareness of body, purification, and emotional stability. The yoga is a wide range of characteristics that may very well reduce, control and cure a particular disease carefully selecting the elements included in the traditions of yoga. Therapy of yoga: the first half of the 20th century, the therapy of yoga has evolved in India. The therapy of yoga is a new discipline incorporating Yogic concepts and techniques with traditional medical knowledge and psychological western. It is a therapy without medicine and surgery without tools. The therapy of yoga deals the holistic treatment of various types of psychological or somatic organic disability. The natural and innate healing resources of the body are promoted by this therapy. Also help in restoring the proper functioning of the various current systems in our body. Depending on individual needs and also to consider the clients physicians, practices of yoga of the yoga therapists projects for patients. Prescribe some of the specific postures, breathing and exercise techniques from the slowdown. The therapy of yoga can reduce various symptoms and keep the body against the various diseases that are mostly developed due to the effort. These various diseases ranging from back problems to arthritis to heart conditions for hyperventilation to asthma to irritable bowels syndrome with diabetes to multiple sclerosis to chronic fatigue syndrome to the anxiety to hypertension. In contrast to this, traditional yoga is primarily related to the stay fineness staff from a healthy or normal individual. But both techniques, however, share an understanding of humans as an integrated system of body-mind, which can function optimally only when a state of dynamic balance. The therapy of yoga is more effective than the general practice of yoga as a safe means of treating medical problems. Benefits of the yoga therapy: 1. The therapy of yoga is good for everyone. 2. It is a modified form of all the traditional practices of yoga and therefore provides the same advantages that traditional practices of yoga provide but without any risk of injury. 3. The therapy of yoga keeps the body flexible and mobile and keep moving up the joints. 4. The therapy of yoga helps to prevent and cure disease. Therapy of yoga in Kerala: Kerala is situated in most of southern India is famous worldwide for its treatment of yoga. Kerala has many resources that offers Ayurvedic therapies of yoga. Some of the features of famous Auyurvedic of Kerala are resources of Athreya Ayurvedic, Ayurvedic Keraleeyam use of, resources Somatheeram, the yoga center of Kare (Kerala's therapy of Iyengar yoga) and more. All these features offer special therapies treat various diseases depending on the condition of the body. These therapies included general body massage with herb oil, steam bath in herb enriched steam, Dhara [with medicated buttermilk], a half massage with herb oils, massage special main body, tretmens of Panchkarma, Slimming Programs, paralysis , weight loss, antiaging, yoga and mediation, therapy and detoxification of rejuvenation. Planning for a holiday of Honeymoon in Kerala? It is beautiful state in India to leave the romantic honeymoon. The state provides some of the romantic setting and the positions on the globe over. The state is decorated by the comforting beauty of the eye, and new beaches, mountains of veneered fog, picturesque beaches, fields of emerald cushion, historic monuments and loteia a more natural beauty. The state is decorated with immense natural beauty that makes it a heavenly place for the newly wedded pair celebrate their holiday of Honeymoon in a romantic way. Celebrating the honeymoon in this beautiful place is the dream come true for thousands and millions of pairs. The hundreds of thousands each year and the pair of newly wedded entire globe come here to celebrate their holiday of Honeymoon in Kerala. Kerala has some of the thinnest point of the world that is unique to other places in the world. Most charming of all the state Kerala is endowed with immense natural beauty. It seems that nature has taken the words to remain forever the evergreen, beautiful and refreshing in Kerala. Come to Kerala for a vacation of the moon of honey and give it a romantic state recently married life. It is the popular destination of India moon of honey to celebrate a honeymoon vacation from time to understand it and feelings and to do it with love. There are several romantic destinations in Kerala which provide the solitude to enjoy your vacation the pairs of the moon of honey in a delicious way. Tides of Kerala: The tides are the original destination of Kerala are warm and charming and peer into your favorite holiday of the honeymoon. The tides are enchantingly beautiful ambiance and provide a complete holiday for romantic. The tides of Kerala are a large network of scenic lakes, ponds, rivers, channels, inputs and water bodies. The pair love to enjoy the cruise houseboat to explore the charm and beauty of the trip so comforting and lovely. A houseboat stay provides the pair to enjoy your holiday of Honeymoon in a romantic and delicious way. The houseboat of Kerala is exquisitely designed and furnished with modern courtesies provide the full ambiance of the sky in your honey moon of Kerala. Beaches of Kerala: The beaches of Kerala are the most romantic destination and most preferred the honey moon of the pairs. Dotted with palm trees to balance the views picturesque beaches with a backdrop of blue sky in Kerala are famous worldwide for its natural beauty and serenity. Some of the finest beaches in the world are in Kerala and are unique to the rest of the beaches in the world. The beaches allow peers to judge their tour of Kerala Honeymoon in some ways more memorable. Spend a romantic time with your loved enjoying the serene beauty of beaches and activities of the beach and make the honeymoon in Kerala the most memorable moments of his life. The hill stations of Kerala: The hill stations of Kerala are also the preferred destination for honey moon in Kerala. The hill stations of the state is endowed with unique natural beauty, spreading of tea gardens, waterfalls whitewater that is the most romantic and charming. The pair can enjoy the full ambiance of Munn that roam the beautiful landscape of the hill stations of Kerala. Take a memorable walk along with her husband in spreading gardens of tea, surfing the perfumed air, take the scenic beauty and have a romantic conversation as you go on. The pairs can enjoy your romantic moments in the beautiful hill stations of Kerala and to estimate their Honeymoon tours to Kerala life. It is known more for monuments, heritage and culture, one of India as the destination of sports tourism. To exploit this aspect and take the incredible India campaign made a further step, the ministry of tourism had given his consent to the European channel Eurosport of sports in June 2009 to shoot a show in particular, Sports Trip ', the `in India. Trip in Sports "is a format that looks globetrotting sports sites and bearing hot-spots around the world. After the consent of the ministry, Eurosport gave a group to India to produce a program on sports and culture in India. The relative cost of total production was around dowels $ 200,000, since the time of air is around $ 680,000. Mediascope advertised, houses one of the largest international representation of the resources of India and also one of the experts custom the biggest media in the country, is the exclusive sales partner of the media in India Eurosport. Mediascope Advertising is said to have been introduced to the environment ministry of tourism and convinced them the need to use the appeal of sports in Europe to the advantage of incredible India. The company is also said to have convinced Eurosport to invest in the partnership of incredible India. In an interaction of the email, Marzban Patel, CEO, Advertising Mediascope India, said the aim is to highlight opportunities for sports tourism in India. This initiative is a long way in expr India to European nations, seducing millions to visit, and will participate in various experiments. This is a first effort to India by Eurosport and is in support of a program of targeted communication initiated by ministry of tourism. It is an attempt to expr many different cultural facilities, heritage tourism in India, a medical hearing Europe through the European sports channel. We are very pleased with the results and are currently in dialogue with other Indian companies to take up the power of the media, TV and digital. As this initiative has helped attract tourists to the country? Leena Nandan, joint secretary, ministry of tourism, explained, stakeholders of the tourism industry was quick job market and our initiatives have promoted the tourism of sports. Tour operators have also organized tours of golf, etc.. We hope the interest in diving and sports also grow with the traditional sports of the "Trip of the show going on air. In addition, the ministry of tourism also produced television advertisements in skiing in Gulmarg (Kashmir) and diving in the Andaman consoles. We have also made rural sports. Under the immediate influx of tourists, it is too early to know how the show was only in the air. However, we hope that this place shows India as a tourism destination of sports. The role of sports for sports which introduce the market to drive tourism, Nandan said, India can not be seen as a market of sports tourism in a purist sense compared to America. But it is a country where the promotions are in huge demand. Could be conducted or sports-entertainment-driven. I am using the term generally the promotions, which means the sale of their product, enhancing visibility. In India, companies consider the purchase of a flag as just that, when it is more. Represents the visibility. The sport engages people as any other genre. There is an emotional intensity and high level of focus when involved with sports. It keeps the attention of the person and allows escape into another world. It can be used as a means to attract travelers who are on guard to escape, relax and enjoy the adventure. The sport of "Trip is a series of five-edition telecast on Eurosport, which detailed some of sports look to India in areas unknown to most estimates. It covers not only the cricket but the golf has brought to viewers in Delhi, in yoga, in martial arts, etc.. All these shows have already been ventilated, for example, cricket on May 30, golf on 6 June, diving on 13 June in Kalariyapattu (the martial arts of Kerala shape) on June 20, and yoga on 27 June. The series, which began in aeration EuroSports early June 2009 during the primetime evening slot on Saturdays, will continue until July 2009. There are several shrines of wildlife, national parks, sanctuaries and tiger reserves of the bird enthusiasts in India that attract wild animals of the world. These are all rich in its flora and fauna. The various destinations of the exploitation of wild animals of India strongly satisfy the desire of the majority of exotic wild animals experience life. The various wildlife destinations in India that have preserved the good Indian wild animals over the years. Located in the state of Rajasthan, Ranthambhore and Sariska are the world famous national parks & reserves of the tiger of India. Ranthambhore National Park: Situated in the Indian state of Rajasthan that is very well known for tigers along with other wildlife like leopards, chink, panthers, and various species of birds. The fort of Ranthambhore and Jogi Mahal is also the attraction of the visit value. Located in the district of Alwar is also known for tigers, leopards, panthers, jungle cats and the other wild attractions. A safari and jeep safari in the nature of forests within the national park of Ranthambhore and Sariska can excite the experience you love estimate for life. The Keoladeo Ghana National Park (the bird sanctuary of Bharatpur) is a global famous bird sanctuary of India. It is home to various species of domestic and migratory birds. In winter, the Siberian cranes can be seen in the bird park of Bharatpur. Are located in the state of Madhya Pradesh national park of Jim Corbett the famous parks of some global wildlife very ideal for the shipment of wild animals and safari nature. It is home to wildlife like tigers, leopards, panthers, crocodiles and several species of domestic and migratory birds. Located in the state of Gujarat, the Gir national park & wildlife of the sanctuary is a sanctuary of wild animals world famous. Asia is home to the famous lion - king of the forest. The Gir forest preserves also other wild animals like chink, chital, nilgai, sambhar the blatherskite, black, and much more. It is the only park in India where visitors can watch sensational activities of Asian lions in their natural surroundings. This is because most of the tour operators of India for wildlife park of Gir give an important place in the bill of package tour itineraries of wild animals. Madhya Pradesh is home to four famous national parks of India. Are Kanha, Bandhavgarh, Panna and Pencho. All are known for tigers. A jeep safari inside the forest of these famous parks can be a hilarious experience of the wildlife tours in India estimate that you will love for life. Safari nature, walks in the mountains of nature with cultural excursions to nearby places also organized with these famous parks. The Kaziranga National Park and Manas National Park is located in the state of Assam. Kaziranga is famous for one-Horned Rhinos. Other animals can be seen in the park are elephants, bison, deer, the hog deer, the swamp deer, the sloth bear, tigers, leopards, panthers, jungle cats of, langurs caps, Gibbons, Wild Boar, jackals, wild buffalo, lizards to monitor, python, etc.. The park also has the rare species of birds. It is a paradise for lovers of nature that has provided ideal conditions for the survival of a wide range of flora and fauna. The Manas National Park is rich in its flora and fauna. The golden langur, golden cat, the pygmy hog, the fishing cat, Rhino, elephants, leopards Nublo up, Pangolin, and various species of birds can be seen in the park. If you have the desire to explore the scenic charm of the northeast of India and Indian wildlife tours also, welcome to Kaziranga and Manas you. The sanctuary of wild animals & the Periyar tiger reserve is one of the destination of the wildlife value of the visit in Kerala. It is situated on the banks of a lake. Tourists can see the attractions that appreciate the wild boat ride to the lake. Periyar is famous for tigers and elephants. The playful herds of elephants can be seen on the banks of the lake. The park also has rich vegetation. The sanctuary of the Kumarakom bird, the bird sanctuary of the Salim Ali, the bird sanctuary of the Chilka lake, the park's bird of Bharatpur, etc.. are the famous bird sanctuaries of India known for different species of domestic and migratory birds. Sunderbans in West Bengal is famous national park known for the Bengal tigers real. Besides these there is increasing use of wild animals in India that can be exploited in the Indian wildlife tours. Almost all of the famous wildlife destinations of India has resources and luxurious accommodation for the accommodation of tourists. Use of wild animals in the provision of excellent accommodation India courtesies with luxury and a wonderful opportunity to experience the wild Indian region. Tides of Kerala: The tides are the original destination of Kerala are warm and charming and peer into your favorite holiday of the honeymoon. The tides are enchantingly beautiful and provide the full ambiance for romantic vacations. The tides of Kerala are a large network of scenic lakes, ponds, rivers, channels, inputs and water bodies. The pair love to enjoy the cruise houseboat to explore the charm and beauty of the trip so comforting and lovely. A houseboat stay provides the pair to enjoy your holiday of Honeymoon in a romantic and delicious way. The houseboat of Kerala is exquisitely designed and furnished with modern courtesies provide the full ambiance of the sky in your honey moon of Kerala. The hill stations of Kerala: The hill stations of Kerala are also the preferred destination for honey moon in Kerala. The hill stations of the state is endowed with unique natural beauty, spreading of tea gardens, waterfalls whitewater that is the most romantic and charming. The pair can enjoy the full ambiance of Munnr that roam the beautiful landscape of the hill stations of Kerala. Take a memorable walk along with her husband in spreading gardens of tea, surfing the perfumed air, take the scenic beauty and have a romantic conversation as you go on. The pairs can enjoy your romantic moments in the beautiful hill stations of Kerala and to estimate their Honeymoon tours to Kerala life. Visit www.indiantourplanners.com/kerala.php for more kerala tours. Located in the most southernmost tip of Indian peninsula, Kerala has a lot going for it in terms of its potential as a destination for holiday. são a atracção turística a mais popular em Kerala. Kerala is endowed with lovely beaches, hill stations of the impressive tides, mindblowing vegetables, wild animals, the bird sanctuaries and rich culture. The tides are the most popular tourist attraction in Kerala. Colorful butterflies to elephants, Kerala is overflowing with the wonders of nature. são ilustres para sua beleza excitante . Worldwide, the beaches of Kerala are famous for their beauty exciting. Kerala the God 'the country has become a popular tourist destination for domestic and foreign travelers. This course is the portal dedicated to the beauty of Kerala which provides all the information you need to make your trip to Kerala memorable. Here you can contact the travel agents offering tour packages to Kerala for a custom 'needs, s.
The exciting beaches of Kerala are the main attraction in the state. The beautiful beaches dotted with coconut palm to attract tourists from around the world to excite beaches of Kerala tours to enjoy the fascinating mix of sun, sand and surf. igualmente atrai os pares e os honeymooners para comemorar sua lua de mel na terra da beleza 3B, da praia e da maré. The beauty of fabulous beaches of Kerala also attracts the pairs and the Honeymooners to celebrate their Honeymoon in the land of beauty 3B, the beach and the tide. pode ser uma experiência fascinante para um par que dure uma vida. Truly, a tour of the honey moon in Kerala can be a fascinating experience for a pair that last a lifetime. são uma outra indicação do turismo em Kerala. The tides of Kerala is another indication of tourism in Kerala. completa de Kerala sem marés. If you can 't imagine a trip full of Kerala without tides. The trips are really amazing tourism. The tides are fascinating mix of channels, ponds, rivers, lakes, etc.. that make this state a popular with tourists. Currently the tour of the oil is completely popular among domestic tourists and international tourists. é empregar uma casa flutuante. The best way to enjoy your trip the tide of Kerala and employs a houseboat. The houseboat that floats on the exciting trip gives you an excellent opportunity to enjoy fascinating views of the field of green pillow lust, coconut trees and traditional villages of Kerala. Truly, a tour of the floating houses may be an experience of fascination of his life. The pairs and the Honeymooners also heading for tours of the honey-moon trip to Kerala. Snuggled between the waters of the Arabian Sea as new in the west and the lusts of Western Ghat mountains in the east, a fine mesh of rivers, forests, exotic wild animals, the tidal stretching of tranquil crystal and a long coastline of beaches are serene Kerala to the pleasure of a traveler. Kerala, God's own country really lives upto its name because of the serenity of Calmness and nature of wonderful people around. A visit to Kerala has much to offer you in terms of entertainment, relaxation of the mind and body, and a memorable stay with their loved ones. A massage, a meditation, Ayurveda (an ancient form of healing diseases in India) and yoga are some of the ways used here proved to him the feeling comfortable, relaxed and calm during vacation and the effects last for several days you go back home. Some ancient herbal and medicinal plants are mixed and used to treat major diseases such as obesity, cholesterol, the hypertension, constipation, osteoporosis, skin diseases, arthritis, the paralysis, the sinusitis, migraine, aging premature and more. The massage of the head and body are also available and performed by experienced masseurs to get rid of your headache and migraine. The holidays usually mean a break from their daily grind, and Kerala offers you a complete experience with sessions of yoga where you can feel the union of your mind, body and soul in some centers as the center of the yoga of Kochi in Kerala, the center of the Sivananda Yoga Vedanta's in Trivandrum, the strength of the Ayur health center, the Sivananda Ashram and the temple of advanced Eastern holistic research (heart) in Kollar. A visit to Kerala is incomplete without a ride in houseboats that has a simple yet sophisticated arrangement and provided the basic courtesies such as bathroom, an area of seats, rooms together, the sumptuous food prepared by the staff, the platform, and a living room open to feel the heat of the sun that shines on the horizon. The cuisine of Kerala is unique and it has a touch of India staff, style of Kerala. Although dominated by South Indian food, you can find continental dishes of Chinese and Punjabi too. But come to Kerala and not having the home cooked food of Kerala as the plants with a tinge of coconut sprinkled on it in the curry leaves, the fish, rice, as in tamarinds etc.. is a bad idea. Some popular dishes from Kerala are Rasam (composition of tomatoes and tamarinds), Appam (components of rice), Puttu (components of the meal eaten with rice and bananas), Payasos (a sweet dish made of coconut milk taken after meals , decorated with nuts and cajus) and fish curry. Although a little heavier in the pocket, the best way to experience the life of nature as New Delhi is once you have a glance of life in the house of a tree. A house of tree has all the modern facilities such as washing basin to good source of water, the shower, the phone, carpeted area for comfortable seating and a balcony. Some are as high as 100 feet above the ground level, giving you a feeling of stagnation with the vast blue sky. Also known as eco-lodges because of the eco-friendly materials used in their construction, gives a view of his elaborate green plantations of tropical forests, of coffee, tea and pepper. The conversation and the entertainment highlight of the biggest in Kerala is the boat race which is held frequently between groups of different people, with the crowd cheering for them next time. Awed by this show of harmony and coordination among peoples. The boat race shows the true sporting spirit of the people of Kerala. The race of the Aranmula boat is organized around the month of celebrations of Onamia where two boats were attached and if alcangam your next destination. The race for the trophy of Rajiv boat Gandhi is a famous boat race held in memory of late Prime Minister of India, Rajiv Gandhi. Kathakali, which focuses on the expressions and emotions, were once a form of art to the rules. Mohiniattam, known for its elaborate costumes and stage classic is run by women. Kalaripayattu, one of the oldest forms of martial arts is becoming It is extremely popular today. These are the popular forms of dance here. The celebrations occur throughout the year with festivals and Onamia, Vishu, Durga Ashtami, Mahanavami and Vijaya Dasami being celebrated with much fanfare. Foreigners can get a real feel of India in those times. Thus, for a mixed bag of gifts and the excitement, entertainment, cultural heritage, the great food and art, come to Kerala. Indian Tour Planners, in association with IGITEC has introduced online booking for this years Nehru Trophy boat race. With online booking facility of Nehru Trophy Boat Race one can book the ticket before reaching the Nehru Trophy venue. This feature of online ticket booking has started last year. Last year many people has used this service to book their tickets online. For Nehru Trophy Boat Race there are two types of tickets, one is silver and other one is gold. The price for Gold ticket is Rs. 2000 and for Silver ticket is Rs. 1000. For gold ticket you will be provided a closer view of the finishing point of boat race so one can enjoy the full thrill of the boat race. If you are booking the ticket through online, then after payment your ticket will be confirmed and you will be provided a paper ticket once you reach the venue. Indian Tour Planners will be organizing a stall near to Nehru Trophy Boat Race venue from where one can collect the paper ticket. After collecting the ticket our representative will guide you to your seats. Visit ntbr.igitec.com to book your Nehru Trophy ticket online. * Do not purchase tickets having no seal or serial no. etc. Kuttanadu in the land of lakes and rivers, competing with the boat is something of a snake cult, just as bull fighting is in Spain. Alise and immaculately counterweight, the snake boats are the pride of every village. These boats race dominate the thoughts and actions of people in this region during the months of August and September, when further 20 minor and major regattas take place. Visit ntbr.igitec.com to find more details about this years Nehru Trophy Boat Race and to book tickets online. The water festival is unique in Kuttanad. No other country in the world has such festivities. The large number of participants in a boat that competes with the only brand still no other sport in the world has a very large number in a computer. How synchronized rowing requires long training and fitness devotee and inherent. Those who addressed the need of the container with the knowledge of the flow of water, energy from the observation of high-class, and they must be well versify in various aspects of competing with the boat. The most noteworthy boat races are a single careless act of a single participant take a boat to lose in the race. Most of the major festivals of the water in the region are associated with the legends connected with famous temples like champakkulam (Ambalapuzha) Payipad (Haripad) and Aranmula. The best of these festivals keeps the flavor of the ancient culture of Kerala, especially the race boat Uthrithathi of the pampas in Aranmula, where dedication, music and art and the rugged grandeur of the boats, known as Palliyodams, make it a unique experience for viewers. Kuttanadu is a vast extension of the water in certain seasons. This area which is flooded in the central part of Travancore is a region that covers 34,443 acres of agricultural region. It is crossed by several rivers, namely Pamba Achankovil and Manimala. These rivers are washed into the lake Vembanadu. Some years ago, the current Kuttanadu was part of the lake Vembanadu. Hired adventurous and illustrious people of this particular part of the country's ongoing recovery of the land submerged by water and one thousand four hundred years. The recovery of the land still continues. The inhabitants of Kuttanadu are agronomists of occupation. Dedicated to the cultivation of trees and coconut rice on reclaimed land. As natural conditions allow the lifting of only one crop of rice, the rest of the time people get immersed in the festivities. Because the boats are in the country needs in the rugged life of Kuttanadu and an extensive area of garden soil is prohibitive luxury organized other sports, it is no wonder that she found the boats as their means of enjoyment. The origin of the current breed of boat is very recent. Before people used to ride a boat like Chundan of AusAID in Veppu, etc. To make a colorful and musical procession. Later created only instill the enthusiasm and spirit that enjoyed among the people of the area, race systems were introduced. The festival of boats in Aranmula snake is still a religious procession. The current boat races in Kuttanad have a history connected with the rules of the time. The boat race Chambakulam Moolam is considered to be the oldest. The history of these boats struggle back 400 years in history when the rajas of the former principalities of Chempakasseri (Ambalappuzha) of Kayamkulam of Thekkumkoor (Changanacherry) and Vadakkumkoor (Kottayam) in the old Travancore area, which are part of present Alappuzha district and Kottayam district, frequently crossed swords on the backwaters of Kuttanad. Chempakasserry troops suffered heavy death at the hands of the Navy ordered higher than its rivals. It soon dawned on the Raja of Chempakasserry that the real defect was with his ships of war, who were inactive and Cumbe. He called on all the architects of the boat in the land to his court and told them of his desire to have better boats, faster for the troops. After days of hard work, a man who was reputed to be the best boat architect Chempakasserry, Koduppunna Venkitanarayanan Asari, came up with a specimen that met the requirements of the split. He had speed, maneuverability and the ability to carry 100 warriors on board sound and eel-like construction was most ideal for launching an ambush since it could easily be kept hidden behind the bushes on the banks of outstanding river. Asari was rewarded the rich and the subsequent battles, the Raja of Chempakasseri emerged victorious. The story turns on how the words of defeated Kayamkulam Raja sent a spy to Chempakasserri to learn the secret of the new vessel of war. The spy, a beautiful youth, considered successful seduction of the daughter of Asari. The mother of the girl, overjoyed by the prospect of doing this as her daughter and boyfriend persuaded her husband to teach the construction of the boat. Needless to say, misleading the youth disappeared the moment the thought that he had learned the secret. Asari was imprisoned by Chempakasserri Raja for treason. But what they released and were watered with many honors when the snake boats built by the Kayamkulam Raja proved no match for ninguÌ No vessels of war in the battle of Chempakasserry below. The delicacy of the design of a snake boat is hard to choose, and even now requires years of apprenticeship under a chief architect of the boat before one could independently undertake the construction of this old boat. When a village decides to have a new boat of the serpent, formed a committee to raise Rs.6 lakhs it requires now to build the boat. Called the architect of the boat and the search for the tree of the required size anjili often leads to the villagers to the high ranges of Kerala. As the snake boat takes shape of the huge trunk, the Asari's `confident in their estimates mainly instinctive. Recently, the first concern of the builders of the ship's boat to make snake as long as possible to build more and more rowers for speed. The boat of the serpent Nedumbhagom recently entered into the Guinness Book of Records as the longest rowing boat in the world. But its 135 feet in length have been made since then by boat Vellankulangara of the snake, which is 140 feet long. Kuttanandu is a place of boats. Various classes of boats are always seen roaming the waters of this part of Kerala state. Kuttanadu boats are of several types according to their purpose. Kochuvallams is used small boats to cross rivers and lakes. It also extends to their sizes. Kettuvallams engines is largely office. Churulans pleasure boats and is considered to be the transport of the rich people in ancient days. Churulan boats vary in length from 12 ½ to 20 ¼ koles and his team ranges from 10 to 36. Chundans is supposed to be vessels of the Navy Chempakasserry rules. Have more than one hundred feet long and over hundred people are usually on board. Both ends of the boats were built in the water. The rear end has a height of about twenty feet from the water surface. Nearly eighty-six people are the rowers, ten to fifteen should give up, four should direct the container. It should be noted especially that the Chundans has maximum maneuverability among all classes of race boats. The variety of Chundan (snake boat) boat race is usually 38 ½ to 48 ½ koles (koles that are equivalent to a 24-inch) long and accommodates 100 to 150 people. Veppu Vallams (Parunthuvalans) deemed that the boats were used to carry the stores for the soldiers on board the Chundans. Vaipu became Veppu usage. Vaipu cooking in the Malayalam media. The design and appearance of these vehicles differ from the rest of the boat race. Parunthuvalan length varies from 28 ¼ to 32 ¼ koles and accommodates 28 to 36 rowers. Oadis or Iruttukuthies has a different origin. He was used for smuggling. It should be noted, it is in abundance in coastal areas near Cochin and suburbs. Its design is for speed. Both goals are similar. The handling is small, practically nothing. They are never turned up and just inside remados shuttle in the middle, turning around the rowers. The Odi, also called Cheru Chuda has a length of 28 ¼ to 32 ¼ koles and 40 to 60 rowers. Various types of boats, all home-made out of indigenous materials are used for boat races, ranging from the great ship of the snake (Chundan) almost hundred feet long and with 150 rowers, the smallest measuring 18 feet and accommodates a dozen teams. The boats are taken out to shovel out of the single tree trunks, usually Kadampu and Anjili (Artocarpus hirsuta). A lot of skill, labor, time and money into making these boats that are objects of envy age and wonder beyond. The most popular varieties of boats competing called Chundan, Churulan, Odi (Iruttukuthi) and Parunthuvalan (Veppu) and each one differs from another in the shape of the rudder and the bow and capacity to accommodate the team. The differences in the construction of the remaining parts of the ships are not yet very pronounced but the structure varies naturally with the ships planned for the calm waters of the rivers and lakes, and receptacles they have to handle on the open pools, where waves and currents have to be found. The handling is quick and easy main concern with the manufacture of boats competing on the rivers and lakes. The water cut is minimized in these boats. PROAS and Their rudders are raised considerably above and also streamline the horizontal and vertical as well. Chundan The Odi and such boats are competing. In the construction of the vessels lying in order to negotiate open backwaters, taking care to consider that nearly falls off the water to the keel and heaviness of the cover is prevented by maintaining the rudder and the bow quite low. At any point, the gunwale is curved to prevent the waves estrallan inside as in the type of boat Churulan. The bow and the helm of these boats are of the same structure to facilitate easy maneuvering. Of all the boats to race, imposting picturesque coasty is Chundan winds the boat. The stern of the ship the Serpent rises about 15 feet of water level, and is embellished with exquisite ornamental designs in wood and brass polished. The extent of the elaborate and expensive ornamentation, typical of the skill of local craftsmen, indicates wealth and eminence of the owner of the boat, long and narrow, the snake boats cut through the water with the majesty and tolerance. The boats of the race, running in Kerala have a lot common with the war canoes of the old American Indian, the Maori of New Zealand and some of the aboriginal tribes of the tropical countries, particularly in view of the shape and structure, and how and inventions of propulsion. Many of the boats belong to the race the common property of local people. Moreover, even the sole owner of the boats are often hired by a group of people belonging to a particular place in order to participate in a race boat. Infact, they spend the money on the order of lakhs of rupees for various breeds participating in a boat. The money required is raised frequently with the public contribution. In fact they consider it as a matter of pride to participate and win a boat race under the label and instead of jercy (Kara). Well, this season of the race boat shows provide an opportunity to enhance the warmth of friendship and brotherhood in the place, which is currently deteriorating in reason varies too much debt. Each race boat is being celebrated as the festival site. It is often a reunion of family members and others in the area. The festivals which have the effect of the individuals placed in remote locations to return to his native place at least once a year. The boat race is held as a festival Kara , children of the village will experience an irresistible temptation to be part of the festivities. The feeling These nostalgic boat races create, and makes every distant place close to his village to return home to participate in the festivities of the race boat. The social impact of the boat race is very high. In the Regattas, the different Karas which owns the vessel enters the race, and with determination, inspired by local patriotism, strive their best to knock off the prize. The competition is severe and sharp, despite the joy and the revelry that surrounds it. 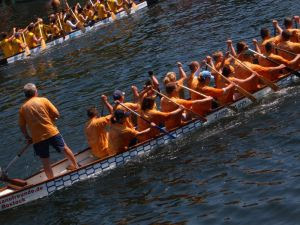 The rowing boats for the race requires a lot of talent, training and work of the team. Row according to the rhythm of the song is not an easy job. Gives the appearance of a popular dance and songs sung on board the ships of the race especially for this purpose are called Vanchipattu.Know compound Vanchipattu more about this Vanchipattus is so popular that they have won considerable recognition are of Malayalam literature. The race for the Nehru trophy in the lake Punnamda, near Alappuzha, held on the second Saturday of August each year, is the most competitive and popular of the boat races. On this boat race of fiercely lutada, the tranquil lake front is transformed into a sea of humanity with some of the estimated LAKH two people, including tourists from abroad, come watch the event. To the people of each village in Kuttanad, a victory in this race for their village boat is something to be celebrated for months to come. The main attraction of the boat race is the competition of chundanvallams ships or boats of snake the snake. Chundans (the snake boat) is an impressive sight, measuring over 100 feet in length, with a raised prow. They were called snake boats by the former colonial rulers, who based the name on a native boat found in Norway, but bear in Kerala 's of Chundans little resemblance to their European namesakes. history of race in the Nehru trophy boat to be associated with the visit of late Pandit Jawaharlal Nehru, the then Prime Minister of India to the official website of Alappuzha.Visit of Alappuzha. Chanced a trip from Kottayam to visit the official Web site of Alappuzha Alappuzha.by of the boat with water logged Kuttanad. A pageantry of boats accompanied him on the trip. The first race was an Impromptu conducted once in 1952 in honor of Panditji who visited Alappuzha. In of that race of snake boats, Nadubhagam Chundan state first. Panditji, who was excited and thrilled at the performance of the oarsmen, jumped in Nadubhagam Chundan, forgetting all security arrangements. The boat prosigueu the pier of the boat that carries the main Minister.On his return to Delhi in December 1952, Nehru donated a silver trophy, which was a replica of a snake boat placed in a wooden abacus. The trophy carries the following inscription above his signature. This trophy later came to be known as Nehru Trophy, and in fond memory of great Panditiji, the people of Alappuzha celebrate the race for the Nehru trophy of each year. The race course has a length of approximately 1370 meters is divided into several tracks for the conduct of the competition. When they are advancing through various tracks, appears as the fast moving snakes. The oarsmen splash the oars in unison with the singing and rhythmic beats of cylinders. The movements of boats of competence are Exciting so viewers get an agreement with the excited mode of uproars surrounding. The festival begins with a procession of boats of the serpent. The snake boats and the variety of smaller boats compete in Kerala as Veppu `of` Churulan ', and the movement of a training oadi below the 1.4 km stretch of the lake as the villagers resistant, your biceps Rippling in the sun, with a row Flourish prepared the corner of the oars signs of Kuchelavritham Vanchipattu Malayalam classic of the poem written by Ramapurathu Warrier a regal King Marthanda Varma of Travancore in the early 19th century during a trip to the boat from Vaikom Thiruvananthapuram. The umbrellas performed in many high stress in each boat, the boats of the golden PROASE snake of black ebony and the patterns of change that make the rowers with their oars transform the lake into a kaleidoscope. The relaunch of floats that give rich cultural heritage of Kerala following the boat race, with the artists performing panchavadyam of theyyam of kathakali OEO padayani. And then a silence falls on the lake front, broken only by the sound of wavelet which doubles the Earth and the rustle of palm leaves in the wind. The boats of the snake line at the point of departure for the big race. While the flag of the trigger from going above the scence stuck in a rigid framework that rowers with their paddles poised, alert the custodians of the pace and steersmen that stretch to meet their long oars. The flag drops in a blur and suddenly starts beating. Enter into the crowd erupting into a roar, birds vibrates above its pole in the trees and the hiss of the snake boat their way down the lake in a blurring of the spray, fighting a battle casts dappled waters. From ayyo-poyye Ayyo-poyye - the pace is a crescendo while the oars dip and flash from 100 to 120 times a minute and the steersmen throw their paddles in a giant arc high. The preparations for the big event started several weeks early. The boat of the snake is spotted with sardine oil for smooth passage through water, the best oarsmen are selected and, under the supervision of the senior most of the oarsmen, the practice sessions begin. Around 150 oarsmen, who represent the town, take the vow to observe strict celibacy and abstinence to the oars to each. Each division in the village and wealthy individuals in the time takes its food back into the athletes on days of massive celebrations in practice on the banks of river. Even in the days of stone, this was a feature of the regatta with caste Hindus, the scheduled castes, Christians and Muslims sitting in the same row for the party that symbolizes the friendship communal in Kuttanad. In fact, the church has a traditional role in the celebrations in Champakkulam although the water festival there is a legend associated with the temple.